English Electric type 2 British Rail Class 23 Diesel Locomotive Built at Vulcan Foundry 1959.10 units were produced with a Napier T9-29 Deltic Prime Mover. 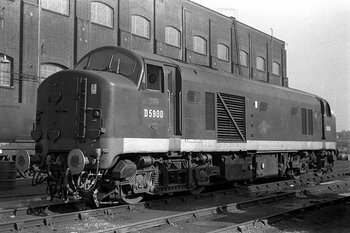 This loco acquired the Nickname Baby Deltic Because of it's similar Build and shape to the bigger Deltic Loco but it was shorter and also because it was fitted with the smaller type Deltic Power Unit. The power unit developed 1100 hp and 44000 lbf of Tractive Effort with a max speed of 75mph. This is a rework of the project listed below, all credit to the orignal authors. This rework has a reduced number of notch's and redefined functions to suit a UK locomotive better. loco starts to resume the notch defined for the speed of the loco. Additional engine and horn/bell sound clips courtesy of Matt Donnelly, recorded from various prototypes around the Northeast. Thanks are due to Fred Miller, Bob Grosh, Jim Walton and A.J. Ireland for their prior work in developing sound projects.